We ventured over to the Lower East Side to try our first Bialy. 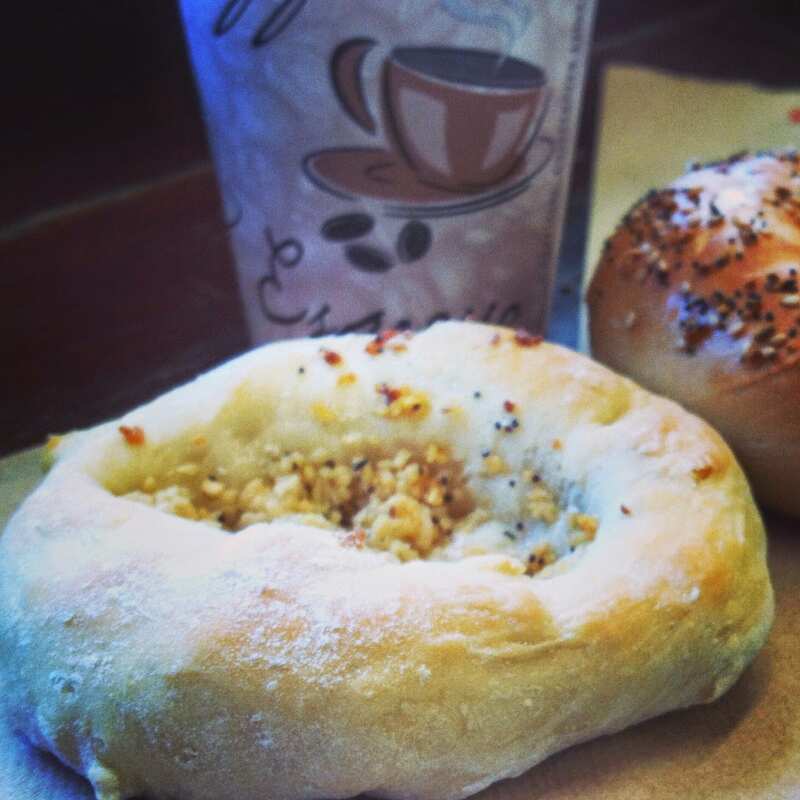 We went to Kossar’s Bialy, and fortunately the lady at the counter gave us fresh, warm garlic bialy’s. . The lady who assisted us hails from Pangasinan in the Philippines, there are hints of her Ilocano accent, and every now and then, she’d sound like a New Yorker!!! Nevertheless, she hooked us up with bagels that just came out of the oven. Ahhhhhh…..I’ve only had bagels in my life and never had a bialy. I enjoyed my first bialy; I kept it simple and just used regular cream cheese….so good! We engaged ourselves with a bit of a conversation with the lady at Kossar’s and she suggested we go 2 doors down. 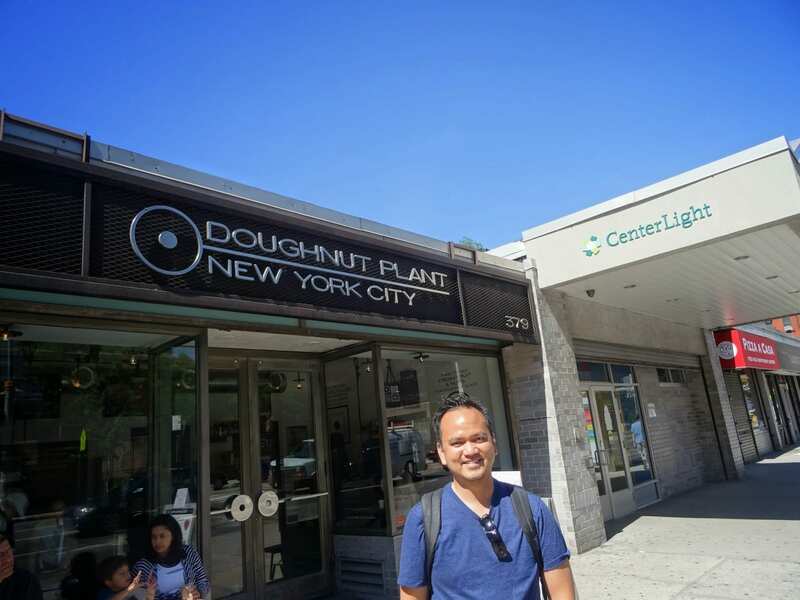 Yes…it was just a few doors down and we entered Doughnut Plant. Oh. My. Word. 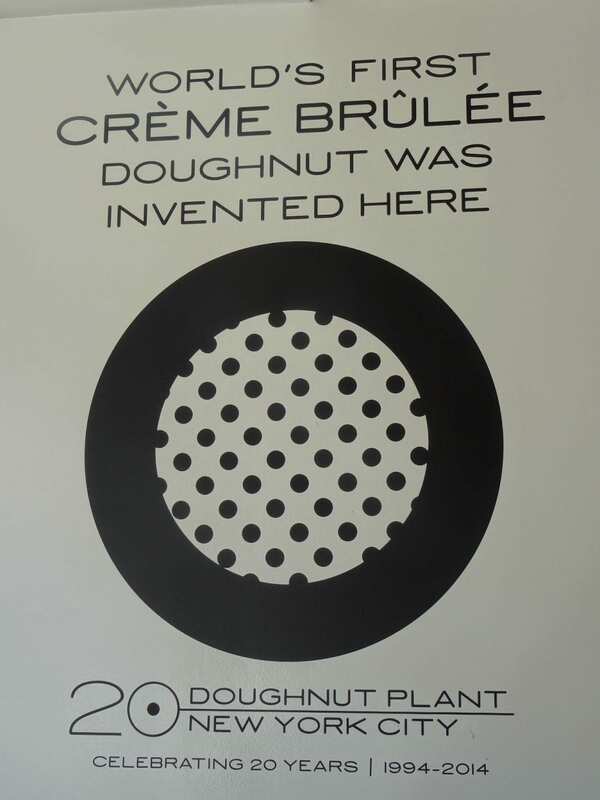 Crème Brulee Donuts and Tres Leches donuts…hands down!!! The only regret I had? I was already quite full from enjoying my bialy. I wish I knew ahead of time so I could make room hahahahaa. But now, I’m a believer. So rich, so good. I shall return the next time I’m back in the city. 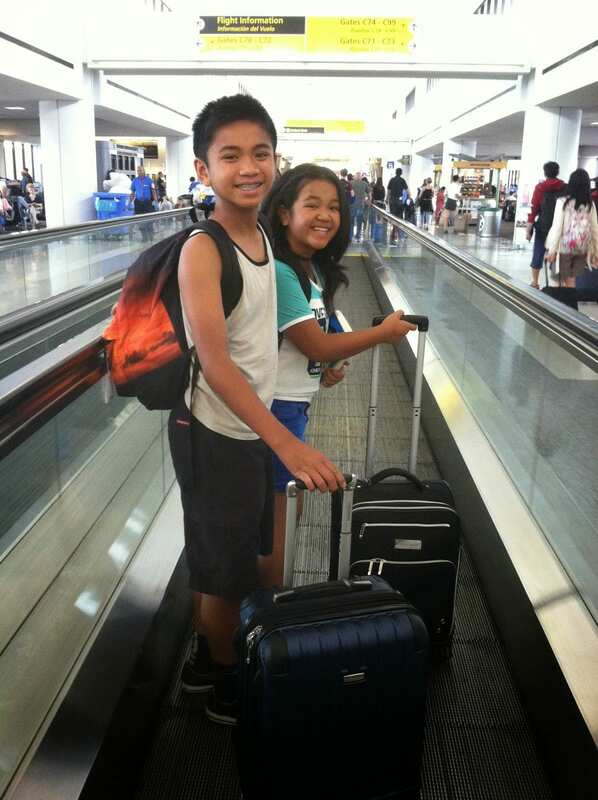 The kids were happy, and then Ethan reminded me about DiFara Pizza…..he said maybe we should go to Brooklyn. It was around 11am when we decided to go to Brooklyn. We were in a bit of a time crunch. We need to be in the Newark Airport by 5:30pm my target time, in order to make it to the 7pm flight with no issues. So I figured, why not? Let’s go to DiFara. I’ve been meaning to go to DiFara for the past few months that I’ve been traveling back to NY, but there was just never a good opportunity. Of course, I had to pick our last day in NY to venture out to Brooklyn. So we took the Q train from Canal St to Brooklyn and interestingly enough, there were a few passengers dressed in “seaside” type of costume. Turns out they were headed to Coney Island for the Mermaid Festival. We got off on Avenue J and walked to DiFara within a few minutes. It was right before noon, and there was already a line that formed about 50 ft deep. 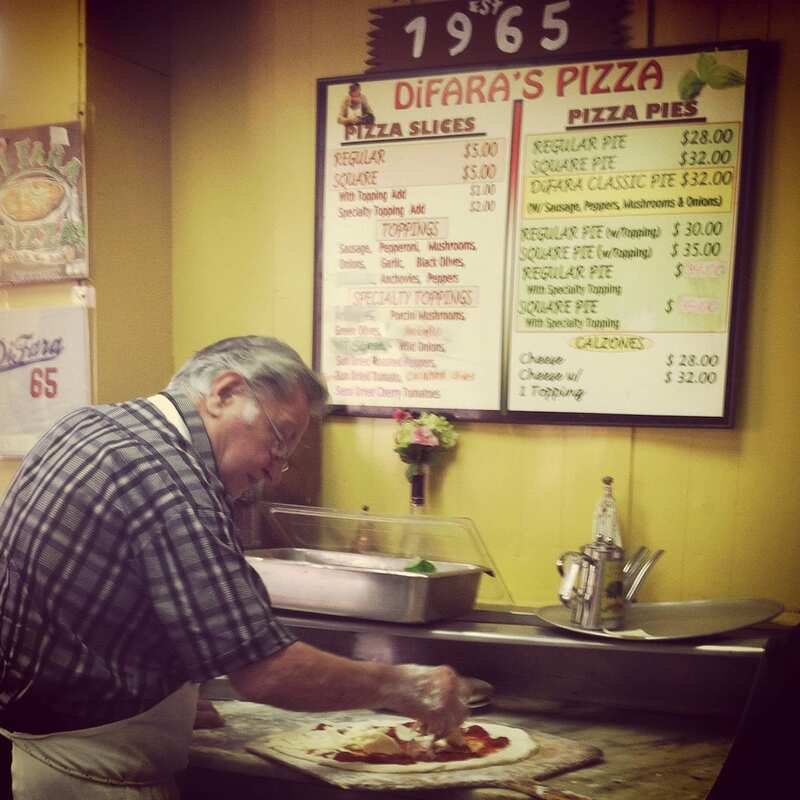 I didn’t realize that Di Fara opened at noon. I knew there was going to be a line, a wait, but didn’t know the process or what to expect. I thought the pizzas would be ready but no….they’re all made to order. 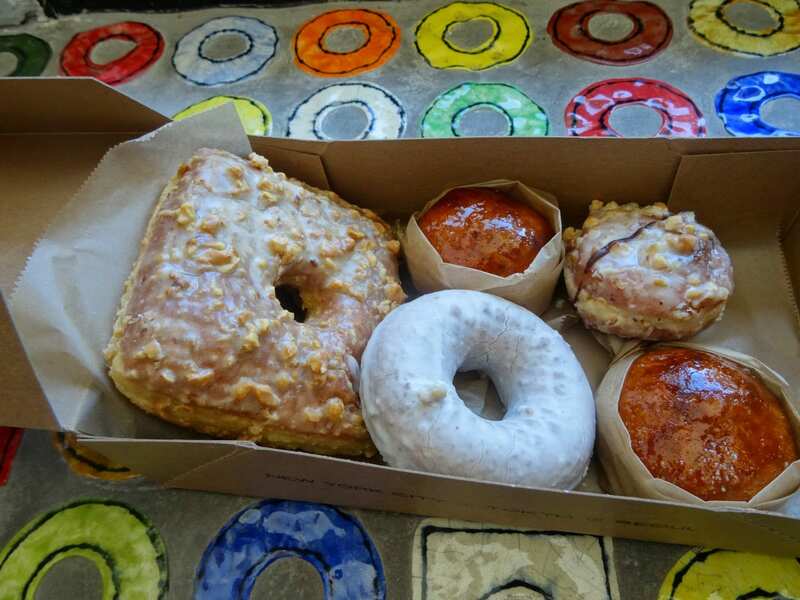 It’s a good thing that we ate quite a bit at Kossar’s and Doughnut Plant. 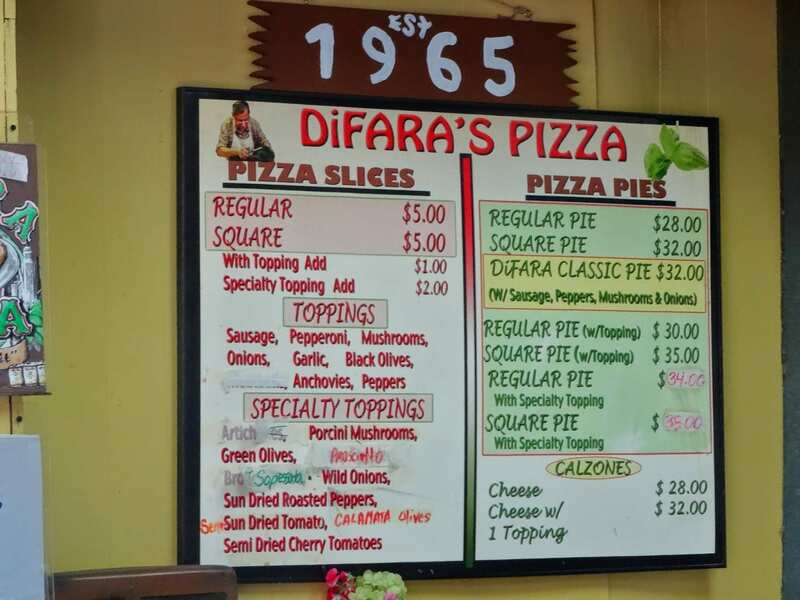 When DiFara opened, it took about 20 minutes for us to place our orders. We were advised that it’s going to be about 1 hour from that point when the pie will be ready. 1 hour? I didn’t mind. Why? Dom DiMarco!!! He was the one who was preparing the pizza. Watching him was like watching Leonardo DaVinci at work. It was a show in itself and we had front row seats. We watched Dom DiMarco and his no non-sense way of making the pie. 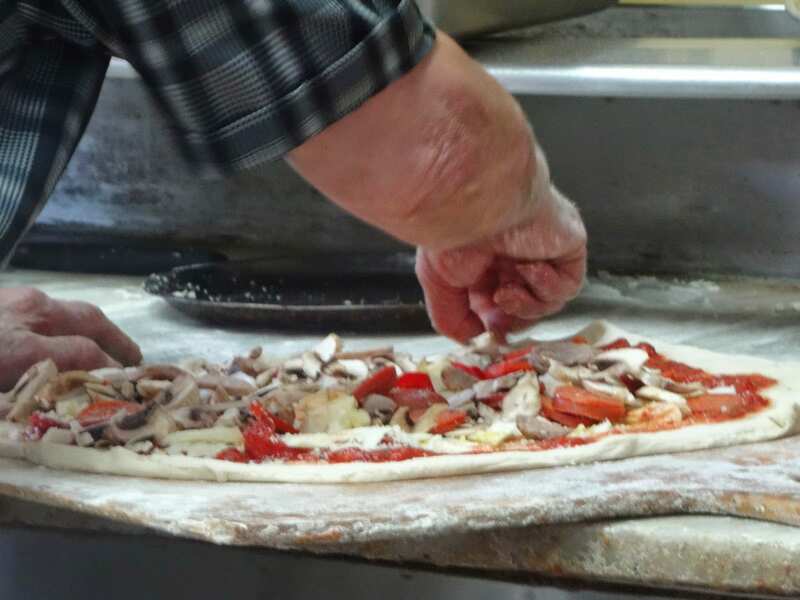 It was very simple, he didn’t use any measuring cups, and for the pizzas in the oven, he didn’t rely on any timers. He just knew! The place in itself was no non-sense. His daughter took the orders and just used a yellow pad, no computer, or no iPads….but she just knew how to organize the orders. There were only 3 of them working there…one guy in the back, his daughter took the orders in front, and Mr. DiMarco prepared the pizza. It was an organized symphony. 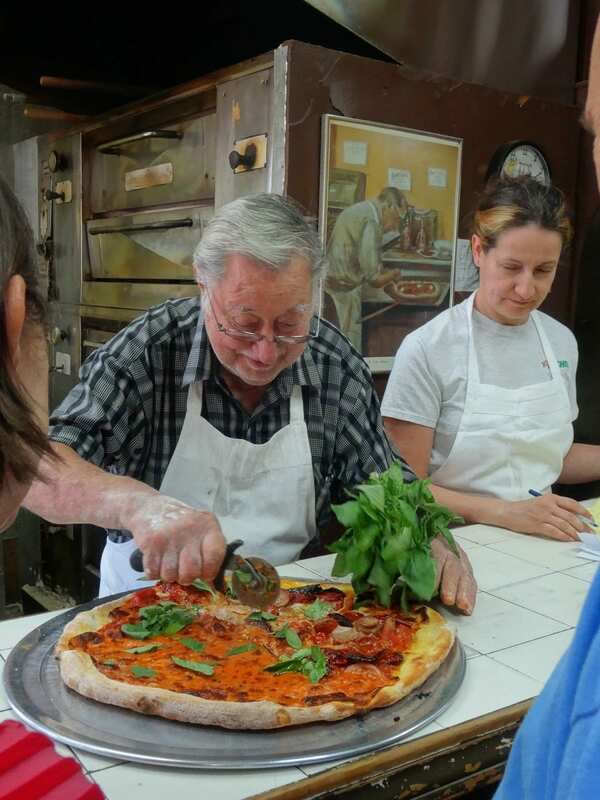 What was most interesting was every time he was about to slice the pizza, he topped each pie with fresh basil. Gorgeous! We watched as everyone ahead of us got their pies. Finally, after nearly an hour, our Classic DiFara pie was ready. Oh man….it was a slice of heaven. The pizza game changed for me that day. All that mozzarella, hand grated parmesan….so simple and it was that good. We simply enjoyed, no wait, we devoured the pizza. Again, my mouth is salivating just thinking about those 2 hours. Hahahahaha DiFara is my new benchmark for future pizzas. I’m hoping to come back again in the future! *sigh* We finished our pizza around 2:30pm. We decided it was time to head back to Port Authority. We still had to catch our bus that took us to Secaucus. From there, the hotel shuttle drove us to Secaucus Junction, and from the junction we took the train to Newark Penn and then off to the airport. I will, however, not worry about all of the bus trips and train rides…in fact, those rides were part of the adventure. I will forever remember the excitement in Ethan and Madison eyes when they first set foot in the city. I will remember all the lucky wins we had with the lottery and rush tickets…..all the glorious foods, and all the amazing sight-seeing adventures. 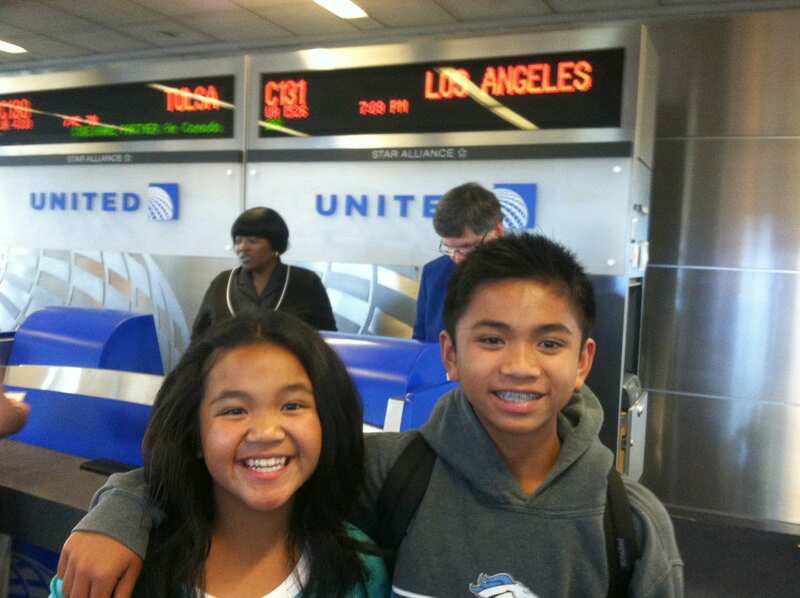 Now that we’re back in California, my kids have been on a NY high, they’ve been reading up on anything about NY, and are looking forward to their future visit. Since this entry is now nearly 2 months delayed, I have since returned back to NY at the end of July. This time, Nancy joined me, no kids – just me and her. I have written my blogs for that trip as well and will post them up shortly. For now, thank you, New York City.